They were very courteous and helpful with our two problems - the front door deadbolt was broken and would not lock; also, the password was incorrect on our printed paper and so we could not get on the wifi. Both problems were fixed immediately. It was very convenient to all our destinations. Also, it gave us, the grandparents, a perfect place to relax, when we had the chance! Great kitchen and very comfortable chairs in living room! They were responsive to questions. Very accommodating in arranging an early check-in by one member of our party. Everything worked, the bed was VERY comfortable, all was as expected, and when we met our hosts they were very cordial. I could have wished for more darkness in the bedroom, because morning light always wakes me early, but that's hard to achieve, and they did have wooden slat blinds that helped. We rented two Old Met apartments for our stay in Charlottesville. We felt lucky to find them since it was graduation weekend. They were amazing! The location was perfect and we were able to walk to campus for the graduation activities and also to restaurants and shops. Also, it was nice to have the parking right next door. It was a little noisy early in the morning and in the evenings, but we were warned about it. We rented the property for several friends from out of town. All of the accommodations were very nice and clean. 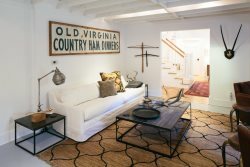 The neighborhood is quiet with immediate access to UVA and restaurants, including Ivy Provisions & BBQ. This house easily beats 4 rooms in any hotel in Charlottesville. Everything was online. It was a smooth, straight-forward process. The rooms were large and comfortable. We felt we had everything we needed to feel right at home. We really enjoyed walking to the pedestrian mall! Beautiful, spacious property at the very center of downtown Charlottesville (literally the center - the living room windows look out onto the city center marker on the Downtown Mall). Was the perfect spot for my (now) wife and I to spend our wedding weekend. Thanks, Stay C'ville! We will surely return and stay in Old Met #202 again!